As I sit here today I'm reminded again of the first time I laid eyes on Miss Madeline Spohr. She was a preemie and I found a great deal of commonality between Heather and myself. Time passed. I got busy and reading blogs, well, time just wasn't there. I always remembered Heather's blog though, and when I got some of my time back I went back and read her blog. And most of all, looked at the pictures of Maddie. Her smile, her eyes that showed such life and love. I remember thinking that I wished that Anna Grace had that much love for life. November 11th will never 'just be a day' for me again. It will be Maddie's day. It's the day that I will celebrate with my children by eating a cream puff and remembering Maddie, Mike, Heather, and Binky. And I will wish, more than a thousand wishes, that Maddie was still here. Heather, Mike - I've never met you 'in person' but you've reminded me to slow down, stop and spend time just 'being' rather than thinking about the next thing to do. You've reminded me that pictures not only tell a story but also are memories that have the ability to not only remind but also to hope and dream. Most of all though, you've thought me that feeling empathy towards others helps *me* to heal from my own loss. On the left you will see the Fight For Preemies button that shows that, on November 17th I will be blogging for the March Of Dimes. I will blog for Anna Grace, for Maddie, and for all the children that have been lost but also the ones that have been saved by the research of March Of Dimes. If you feel inclined, please join me in this effort. 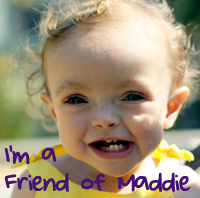 Maddie, I will always wish that I had a chance to meet you - to see your smile - to listen to your laugh.